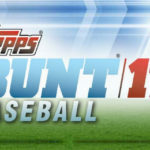 2017 Topps Bunt blends physical product with the digital products from the app of the same name. Coming in at a very low price and featuring a relatively small base set, Bunt cards are perfect for set builders. There are also a number of chase sets and variations to track down as well as autograph cards falling one per case. Our checklist, available under the tab above, includes all the cards and can be broken down by many parameters. Follow this hub using the button on the right and you will get automatic updates regarding this set when they become available via your "Following" page. In the latest "Gut Reaction" video, Crackin' Wax shares his initial thoughts on the 2017 Topps Bunt baseball card release.